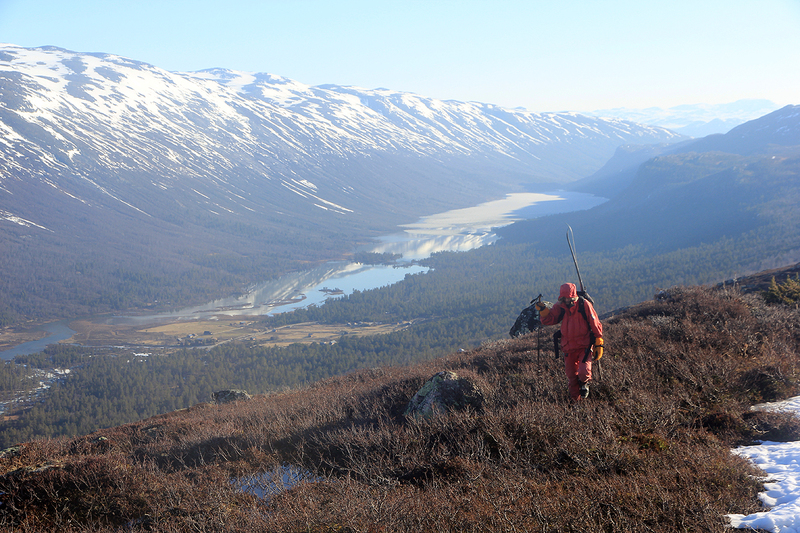 The best starting point is from the DNT hut Sota sæter. This hut is often closed and there is no self serve option when this is the case. Drive 27.5 kilometer up the Otta valley from Lom (Hwy. 15 towards Stryn). You are then at Dønnfoss where the smaller Hwy. 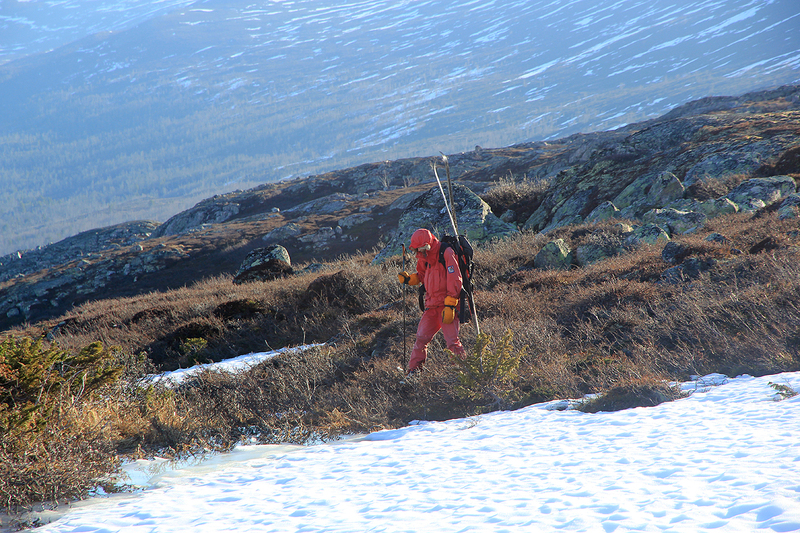 486 forks left and ends at Sota sæter. The last part of this road is a toll road with an automatic payment system that only accepts credit cards (NOK 60 in 2023). You will pass the DNT hut and cross a small creek to find the parking area. There is another toll road that continues, however this is often closed and it is not helpful for this climb in any event. The parking is roughly at N61.80877, E007.70969, elevation about 745 meter. You can actually see the mountain from the trailhead. Start out along the continuation of the toll road (crossing another gate), but then very shortly, fork left on a signed trail to Nørdstedalseter. Follow this uphill along the creek Veslsota, then cross (there is a bridge a bit upstream), you will arrive at a new trailfork where you go right. 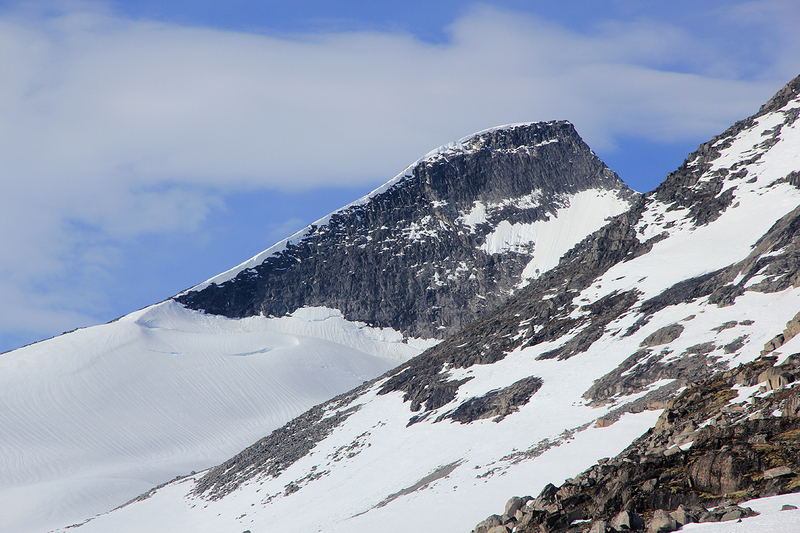 This route is called Nørdstedalseter via the Fortun glacier. 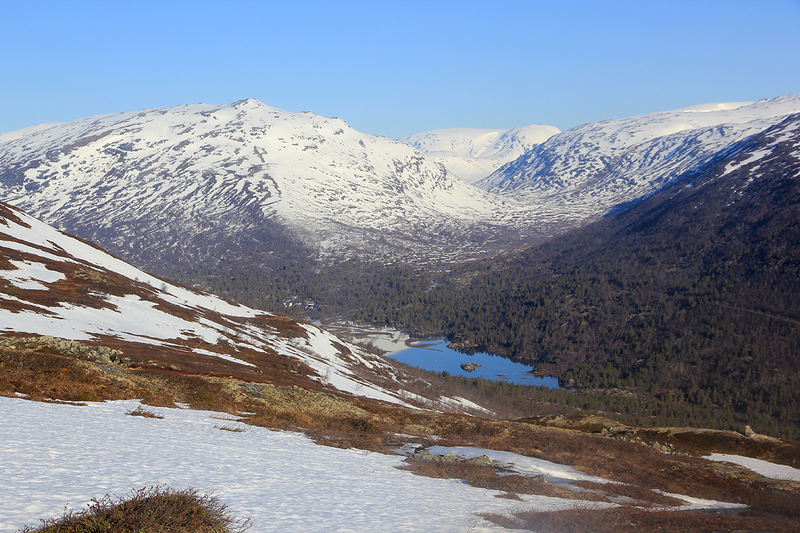 The route enters the valley Tverrådalen, this valley runs north of the mountain. 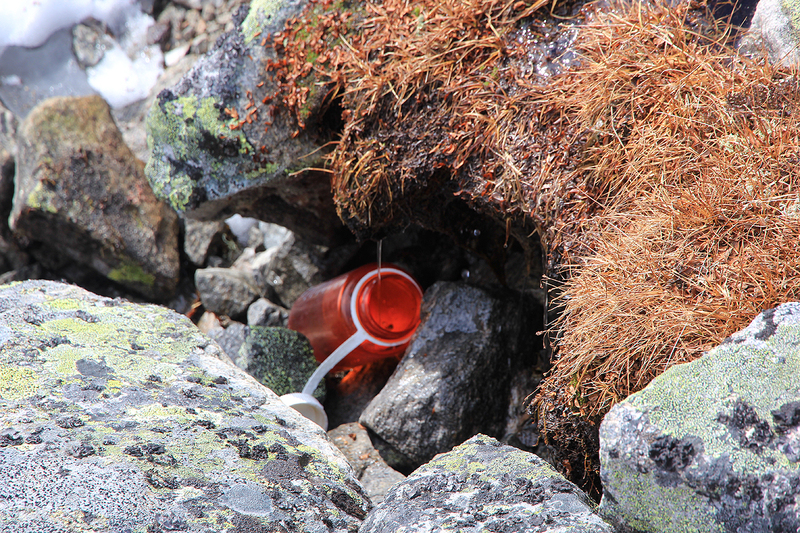 There is another trailfork here, this time left in order to gain a plateau at about 1400 meter just northeast of the mountain. Note that the summer route forks left a bit before the winter route. 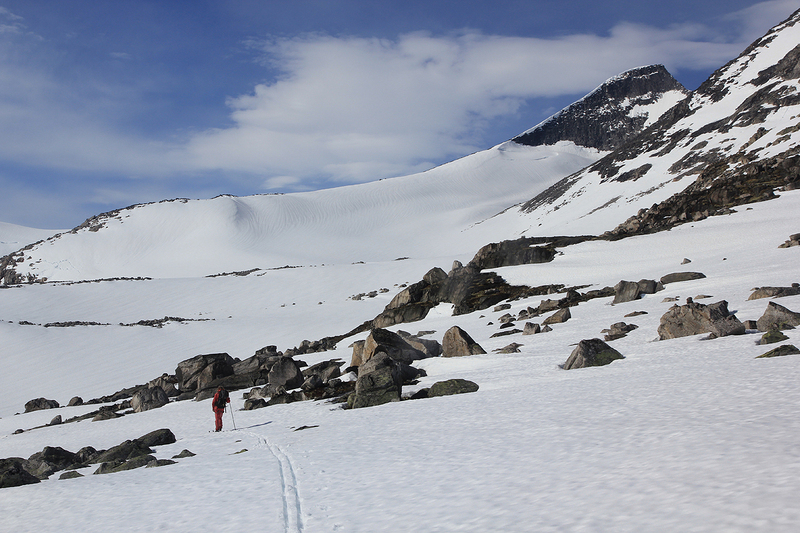 The skiing route ascends closer to the creek that comes down from the three lakes located at the 1400 meter level. (see comments). 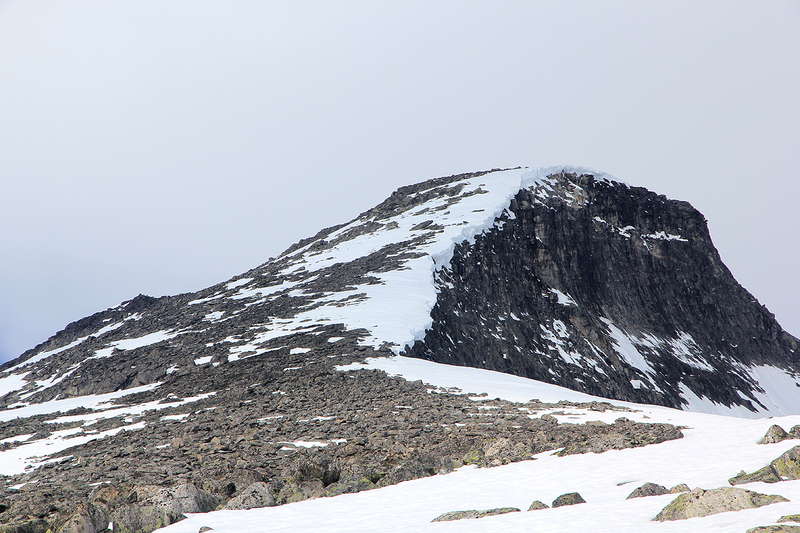 Once you reach this plateau, the east ridge and the highest summit will begin to come into view. Continue south on the east side of the mountain to the glacier Fortundalsbreen. Turn the steep end of the (east) ridge coming down from the summit and ascend the glacier along its side next to the ridge. Somewhere above the 1600 meter level, ascend right and gain the ridge, then follow this to the summit. 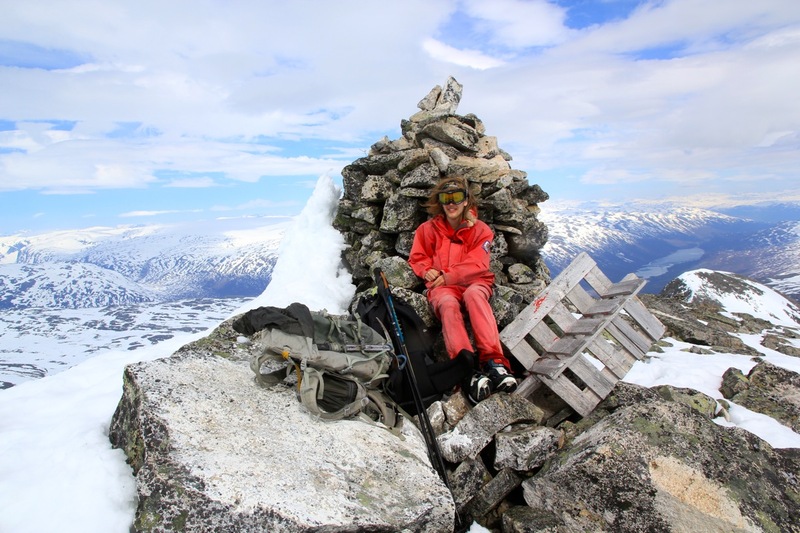 This ridge gets somewhat steeper at its upper part, the easiest route in summer surely stays at (YDS) class 2+, however, it is easy to end up in terrain where a few class 3 moves will be required. We drove to Sota sæter after a nice dinner don in Sjæk. It was by far the warmest day of the year with temperatures in the 23-24 degree Celcius range up in the valley. 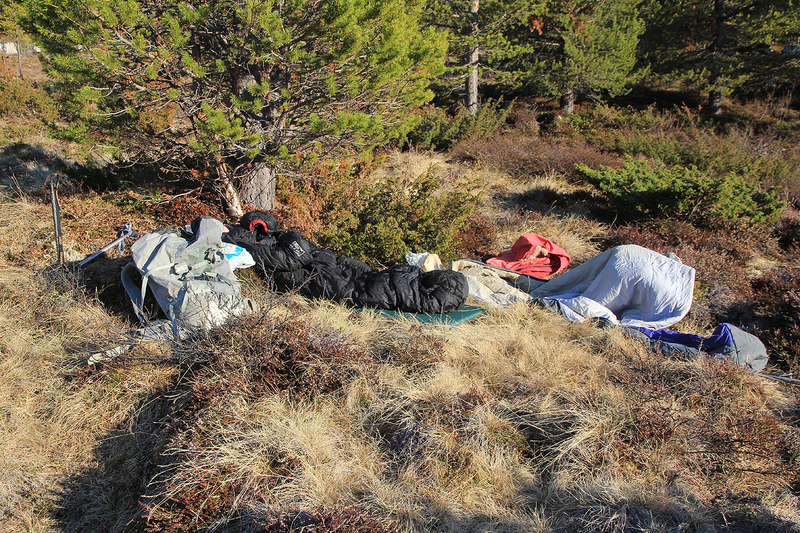 We had decided to just sleep outside and get an early start since we needed to drive back to Bergen in the afternoon. This trip looked rather easy and my idea was to be back around 1300, thus making dinner in Bergen. We slept well and woke up with a bit of frost on the sleeping bag around 0500. A quick breakfast and we were on the trail by 0600. The transition from walking to skiing was not as clear cut as the previous days. Soft, wet snow, but too limited for skiing. 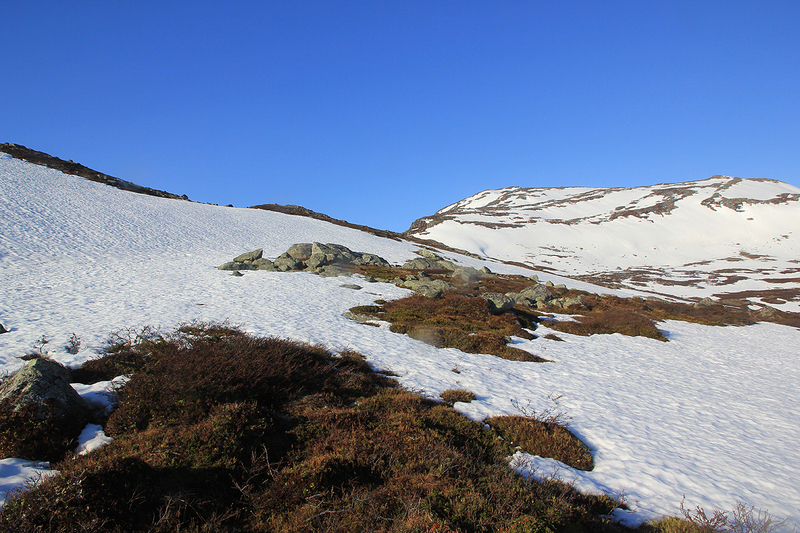 We started skiing on some patches of snow at about 1150 meter, but several on/off transitions were needed. Skiing became easier in Tverrådalen as we followed the cairned (summer) route on quite a hard crust ascending up and out of the valley. Higher up, we again ran into smaller areas with rocks that needed a ski carry. 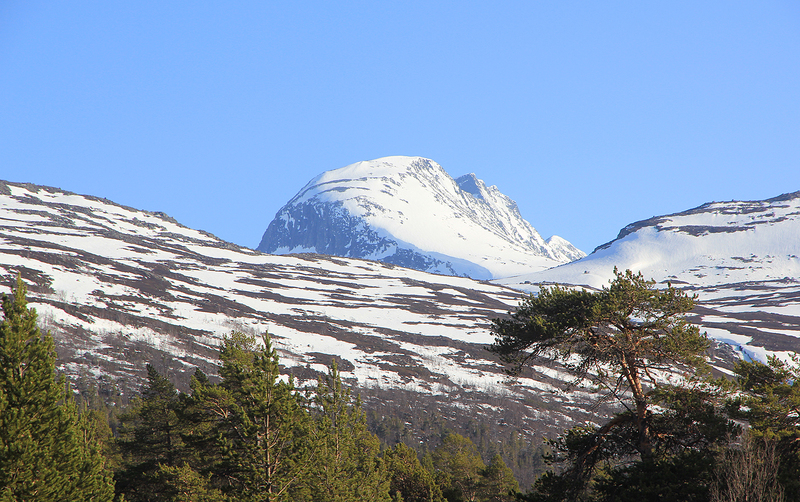 The good news being that our mountain looked appreciably closer and indeed very nice. The next section was easy and we arrived at the Fortun glacier below the east ridge at 1000. A bit surprising that we had spent 4 hours to here, even more surprisingly, it took us 2 more hours to climb the peak, arriving at the cairn by 1200. I had expected that we could ski this ridge in mid-May, however the rocks dominated and we left the skis at the base of the ridge. What made things go slowly was the combination of a bit slippery ski boots and lots of rocks with snow in between them. The patches of snow that remained, were completely rotten, thus sinking in at least one meter, sometimes more. We tried to avoid the snow at almost any cost, but this made our line of ascent move left and off the line that is used in the summer. We ran into several short sections of (YDS) class 3 scrambling, fun but time consuming. The return was definitely going any faster. After about 15 minutes at the summit, we returned to the skis by 1400. Skiing back was much better, we found the birch branches that had marked the winter route in Easter, thus avoiding several carries. 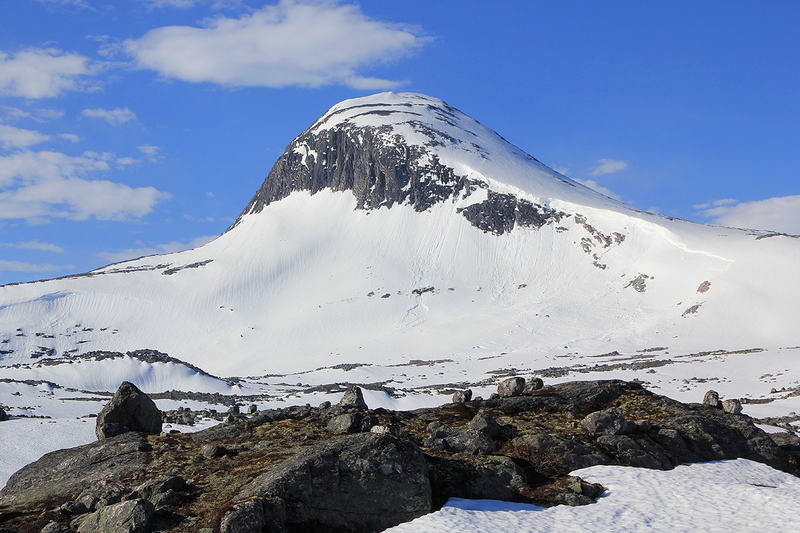 Arriving back at 1615, we were both quite happy with a third day among Norway's highest peaks. We drove back to Bergen, arriving at 2215, Heidi had prepared an excellent evening meal! Many thanks to Pål Jørgen for good company. Collecting water, on the east ridge.